I used to dislike the colour purple. Lately I have been loving pale variations of it, particularly when they have hints of grey in them. Lavender, lilac, mauve, plum, violet. I am not alone in this and am probably picking up on trends in a subsconscious way. One of my all-time favourite vintage dresses is a lovely pale lavender number made of that polyester chiffon I mentioned in my last post. I changed the colour of my blog header a while ago to reflect my newfound appreciation of lavender. I can't get enough of it. 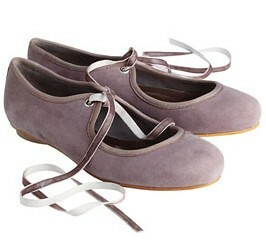 I have added the "dull mauve" ribbon tie ballerina shoes from Toast to my basket about six times since I first saw them, removing them once I had typed the resulting charge into xe.com. Now that they are at a price I could almost justify with the shipping cost, they are sold out of my size. Which is fine, as I'm sure they would look funny on me. Since I also can't get enough of headbands these days, I made a variation of the Françoise headband with lavender velvet ribbon ties. These headbands are the kind of thing that I don't need everyone to love, because I love them so much myself. It doesn't matter that I have yet to wear one in public. In the summer I wore a braided suede one that I had made to see a friends' band and another friend told me he thought the "Pocahontas thing" was hot. So there you go. Hot. the lavendar headband is so pretty & i can't wait to see your new project! Oh! Well, I hope it won't be anticlimactic! It's just a continuation of something Geoff and I started about a year ago. i made my daughter a headband to match the one i will be getting for you in the mail. i'm obsessed, too! coral, lavender, grey, and navy. those are the colors i think about the most nowadays. I am loving lavender these days too! Those shoes are very sweet. and i think headbands are incredibly chic. I have a couple and always get positive comments when I wear them. i love your new project already, if it involves those hoops! and we've discussed this before but purples and lavenders are so exciting to me right now too. Wow your blog realy does rub on on me, today around the shops I kept picking up lavender and peachy coloured clothes and in the end bought three pairs of tights each in differnt purple shades love!